I would like to thank everyone for that came together to help the Weald Foundation. We didn’t reach our target but still, we managed to get some fundraised that will certainly help. 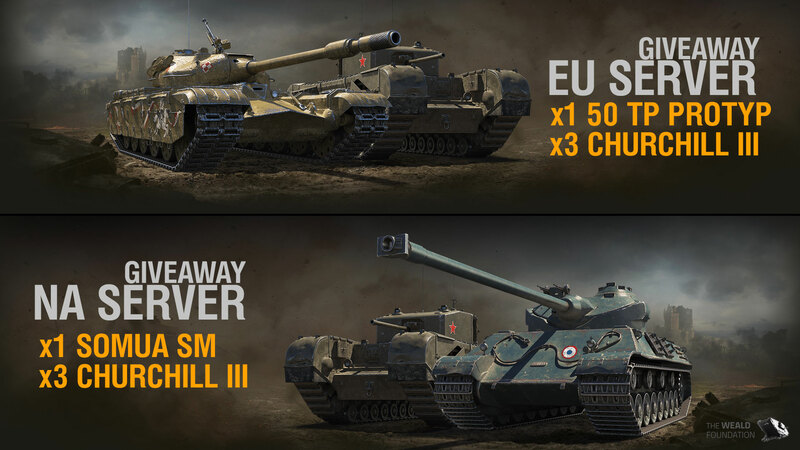 But you know me, I can’t just give away the signed posters without some extra surprise goodies that you all enjoy: two Tier VIII Premium heavy tanks and six Tier V Premium heavy tanks. Prize Pool for EU and NA regions. I will be live on Thursday, 23rd of August 2018 from 6:30 PM British Summer Time, from The Weald Foundation to announce the winners of both signed posters and if you want a chance to win one of the Premium tanks all you have to do is tune in. In the meantime, if you missed the donation giveaway, I will leave it open until 23rd of August at 5:30PM BST, if you still want to participate just make a small donation and your name will enter the prize draw for “Tiger! Tiger!” poster! But that’s not all, I won’t be alone during the live stream, Michael Gibb, Weald Foundation Director will be joining us to give you more details about the amazing collection they have present at the Weald Foundation and answer any questions you might have! So, don’t miss out and come and join us!